This post is brought to you by TruMoo® and The Motherhood. However, all opinions are my own. 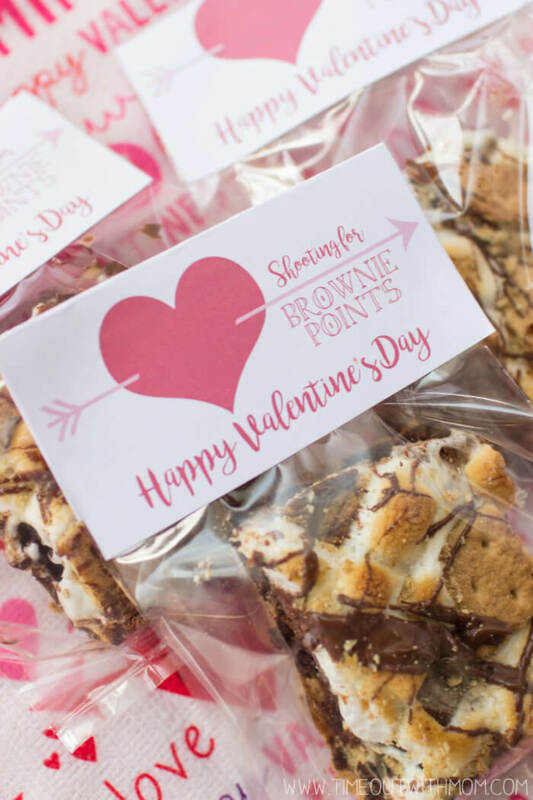 These ooey-gooey S’mores Brownie Bars are an easy classroom treat made with love, for all of your little Valentine’s. No bonfires required! Who is ready for Valentine’s Day? It’s my little guy’s first Valentine’s Day in a school setting and we are quite excited! He told me a couple weeks ago that he has a “girlfriend” and needs to buy her a present. What?!? I just can’t deal with this so soon in life. Aghh!! In any case, his class is having a little party and I received special permission to bring in a classroom treat. Yay! Every day at drop-off, the kids get so excited when my little one walks through the door. It’s pretty cute to see them all run up, hug him and be so welcoming. Oh, the sweet innocence of children…It’s truly heartwarming and shows me that he’s obviously being kind and a good friend in school. For me, that is important. I was bullied in the upper grades of school. I was the quiet one who kept to herself and people just liked to pick on me. When my kids started school, I swear that was one of my biggest worries. I know, crazy right? I feared that they wouldn’t be accepted by the other kids, that they wouldn’t be outgoing enough or even just a bit shy. I was scared that one of those things would make them susceptible to being bullied. Those were probably my own insecurities talking, though. Thankfully, both of them are getting by very well and my worries have been eased. With that, we are starting yet another busy week and my little guy is super excited to score some brownie points at his class party. Get a Mooove on and download my free Shooting for Brownie Points printable, so you can get started on your own classroom treats! Since I was given permission to make a special treat, I knew it had to be something the kids would love. What child doesn’t like chocolate? And who doesn’t like s’mores? 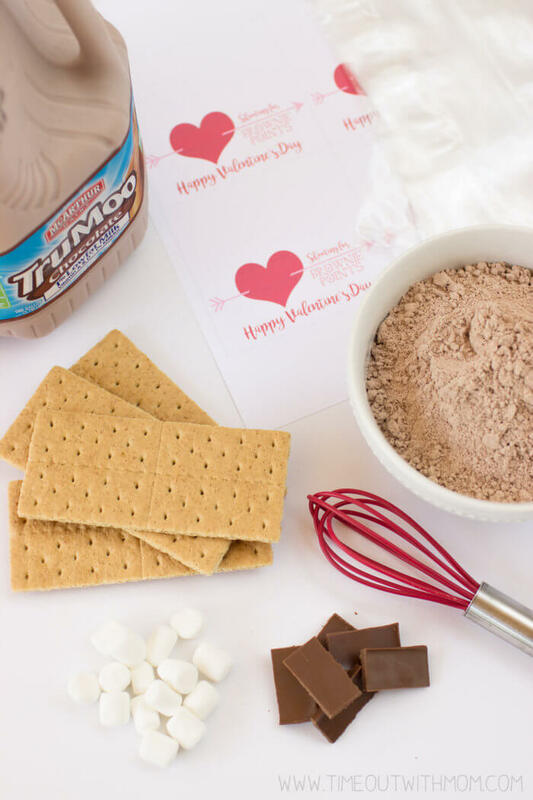 This is the perfect classroom treat for Valentine’s Day! Many years ago, I began substituting the water in all of my baking recipes, with milk. I found that the texture was a bit smoother and it enhanced the flavor. I started this with my cakes and cupcakes and finally moved on to other treats. I was forced to use chocolate milk in a recipe at one point because I was too lazy to run to the store and had already started my mix. That’s when I realized what I had been missing out on. That chocolatey flavor just popped! I tried it in a batch of brownies and I never looked back! 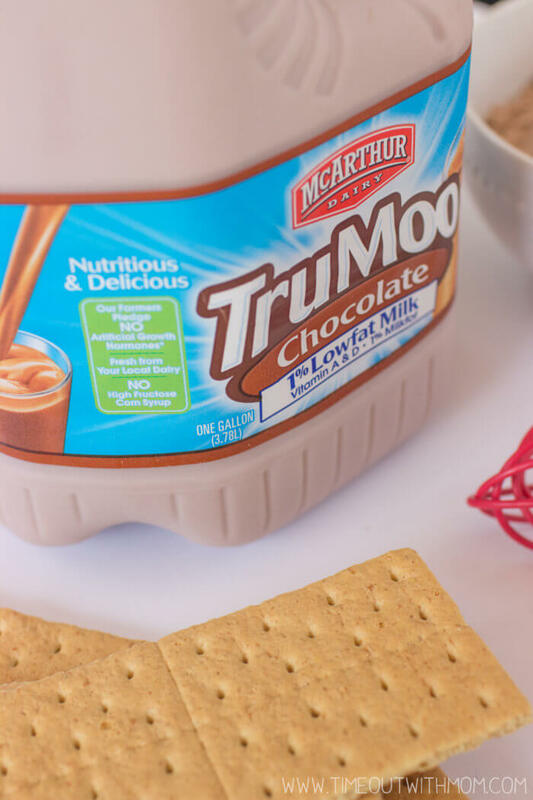 I use TruMoo® Chocolate Milk because of its nutritional benefits and It’s perfectly sweet, without the high-fructose corn syrup. It has eight essential nutrients that kids need and is always sourced from local dairies. And of course, my favorite part…no artificial growth hormones and GMO ingredients! Find TruMoo® at a store near you, in the dairy aisle! Now, how about we get started on these delicious treats? Begin by spraying a 13″x9″ baking or brownie pan with cooking spray or lining it with aluminum foil. Line your pan with graham crackers, edge to edge, as this will make for a nice and crunchy crust. Mix the brownie batter according to the package directions and substitute the water for your TruMoo Chocolate Milk®. 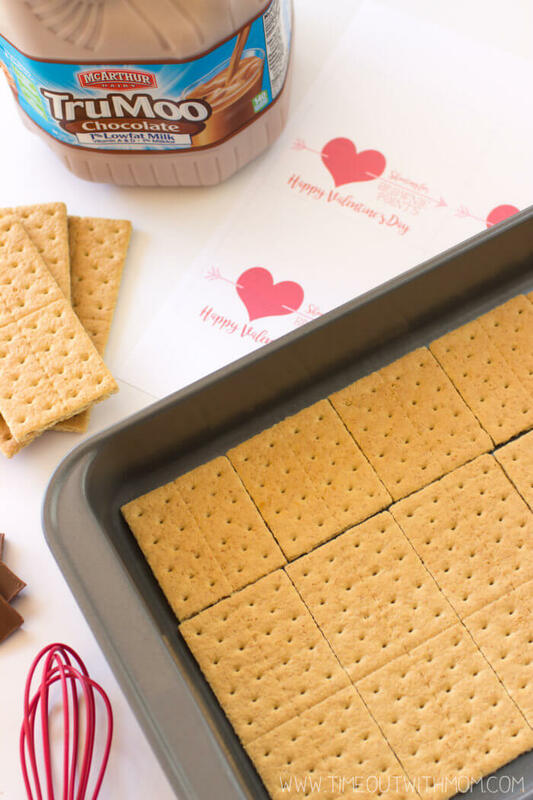 Spread brownie mix evenly over crackers. 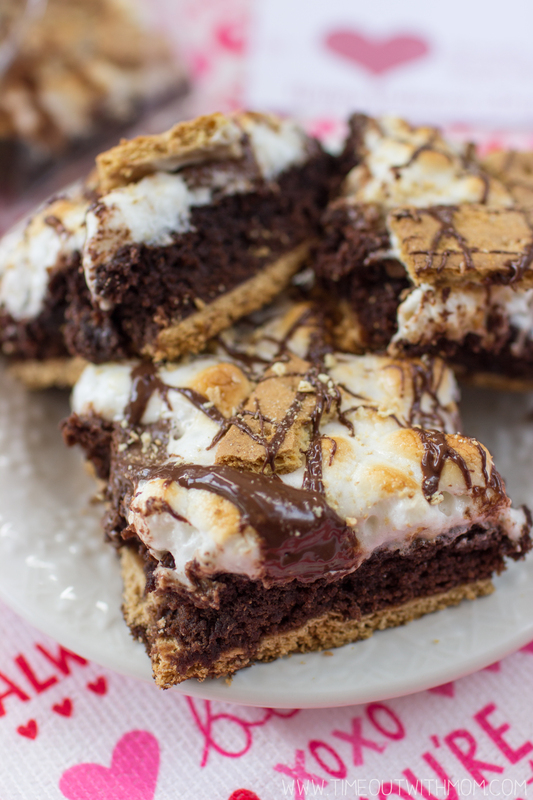 Remove brownies from the oven and sprinkle with marshmallows, milk chocolate bar pieces, and some broken graham crackers. Bake another 5-10 minutes, or until marshmallows are slightly puffed. If you want that golden brown coloring, put your broiler on for a few minutes. If you use the broiler, be sure to watch them the entire time so you can turn it off once you reach the desired coloring. Allow brownies to cool. You can stop here, or continue if you’d like to add some more fun! Once your brownies are cool, melt the chocolate chips for 30-45 seconds in the microwave. Stir, and continue melting in 10 second intervals until fully melted. Add a few drops of oil and stir melted chocolate to thin. Using a fork, dip it into the melted chocolate and drizzle on top of the brownies. Add crushed graham crackers for added texture. Allow the drizzle to harden. Cut brownies and bag in plastic treat bags that are 4.25″ wide. Download, Print and Cut my FREE PRINTABLE. Attach the printable to your treat bags with tape or staples. Deliver your classroom treats, and rack up the brownie points! How cute did these turn out? They will be the talk of the class this Valentine’s Day, that’s for sure! And the brownies? Oh! They are so delicious and even better with a cold glass or warm mug of TruMoo® Chocolate Milk! I have already had requests for another batch! Begin by spraying a 13?x9? baking or brownie pan with cooking spray or lining it with aluminum foil. What are some of your favorite Valentine’s Day treats?